Bureaucratic dust from the sixteen day government shutdown is beginning to settle. Obscurity still hangs in the air, but at least some of us are able to go out to the woods for a little while to start catching up. Brent and I closed the Fish Lake guard station today–hung shutters over the windows, loaded two empty propane cylinders into the truck, took one last look around to make sure all is shipshape prior to the snowfall that closes the road. 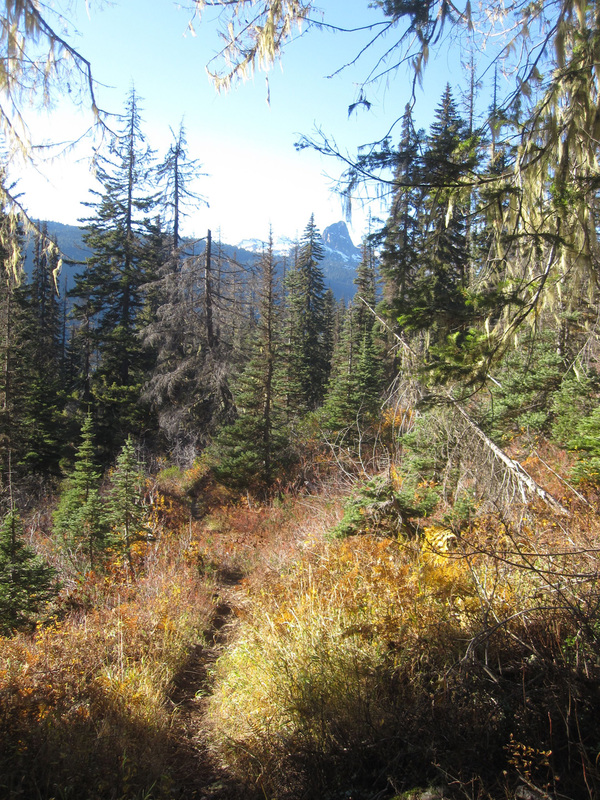 Then we went up to the Paddy-Go-Easy Pass trail to dig the drainages. It’s always good to buckle the backpack and start walking. Our eyes go to the angled ditches in the trail that divert running water off the tread. They are partially filled with soil and rocks that have been carried down by gravity. We scoop this material out and cast it aside, clearing the way for the next round of erosion. Over the years the trail crew has learned that maintaining these features prevents the loss of trail tread. We like doing drainage. Besides being free to work, I am also free to let my senses loose in the trees. The air is unusually warm, kept that way by a bubble of high pressure that has parked itself over the Northwest. The blue sky days are strung together like beads of water on a twig. I am always struck by the quality of October light in the mountains–sun that angles through the trees casting deep shadows while also illuminating the landscape with a brilliant glow. Frost has killed tender leaves and changed the colors. The slant sharpens by mid-afternoon, and we walk down towards dusk. Transient beauty brings and upwelling of sadness, as poignant as the cries of wild geese flying south. The forest is letting go of another growing season, gathering for a time of dormancy. My body is slowing down too, ready to be inside when it’s dark, ready to curl up, tail over nose for a nap. But that rich light penetrates golden cottonwood leaves on the drive home, filling my head with brightness. And I want to stay awake for that, at least till snowflakes swirl on the wind. Deb, I happened to be listening to a song by the Piano Guys Beethoven’s 5 Secrets when I read your Post. What an amazing combination. It brought your words to life in a fantastic combination with your description of the rich light that was penetrating the golden cottonwood leaves. Wonderful, at least to my senses. Pat, I love those moments where music aligns with whatever else is going on. So glad you got to have the perfect soundtrack for golden cottonwoods. Thanks for reading, as always. Thank you for winterizing the Fish Lake guard station. The firist time I was there was 1957. Bill, it is a pleasure to be a part of taking care of that special place.